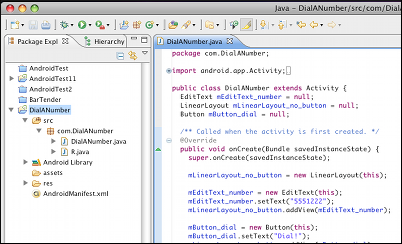 Android Development Demo: “DialANumber” – How to write your own very first Android program – Made Simple! While I think the Android development examples are not really good and straight forward perhaps some of you come along with them. 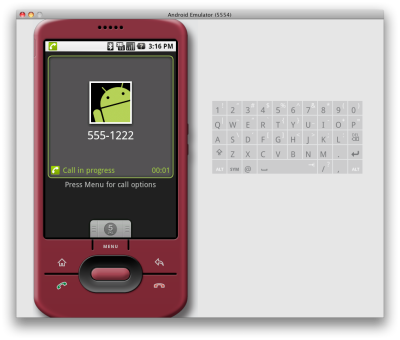 However, I would like to provide you a very very simple example here on how to write your own first Android program. Hit the “Dial!” button next to the input field. Hit the “green dial” button on the bottom of the device. I am looking forward to find some time in the near future to pimp this example a bit. I am thinking of a number field filter adding (which looks a bit confusing in the API documentation) or something else. Suggestions are welcome! In case someone is really lazy interested you can download the whole example project here: dialanumber.zip. Sir, m new to programming on Android platform. [2009-02-10 09:10:32 – HelloAndroid] Android Launch! [2009-02-10 09:10:32 – HelloAndroid] adb is running normally. [2009-02-10 09:10:32 – HelloAndroid] Could not find HelloAndroid.apk! m not able to fix the error. could u please help? what are the enviroment variables to be set? should i set any env var of the jdk to anything particular? could you please help and thanks. The “Hello” example should work without any adjustments in settings. 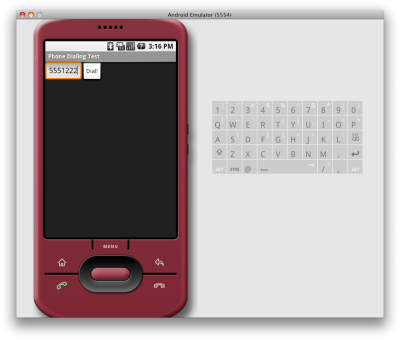 Pingback: Androidium » Blog Archive » How to write your own very first Android program - Made Simple! hi, i have to write a program for school, that uses the gps to find my location and then tells me which restuarants are near by and then pulls up thier menus and nutritional information and then it keeps track of how many calories i have eaten for the day. I am totally lost and have no idea what i am doing. I need help! I cant give you concrete information just some tips, i hope you are familiar with java-programming. If not you should read the book “hello android” by ed burnette. After that you you know how to get your GPS-Position and using also the Maps from Google, its all built-in in the SDK. Then you should find a way how to get Information about near Reastaurant that are close to your GPS-Position, i think google-maps is also providing functions for that. Then you must make those Restaurant-icons clickable, so that a new Menu shows up where the menus are listed like “Rice 10cal, Sprite 10cal etc.” I would use Dummy-Data for that, cause how should you know what menu they have and how you should get that information. You can make that menu from the type “spinner” and scroll through it and then select a item and then click on a button eat. In the background you are adding the cal values to an Integer or float-Variable. With the “Go back” button you came back to the map. I think you can overlay the number of calories on the map, so you can always see it. Gud luck! Hi, i just tried your piece of code and when i push the button “DIAL” the call doesn’t start. Please, try to dial “911”, i think it doesn’t allow to make it. String	CALL_PHONE	Allows an application to initiate a phone call without going through the Dialer user interface for the user to confirm the call being placed. String	CALL_PRIVILEGED	Allows an application to call any phone number, including emergency numbers, without going through the Dialer user interface for the user to confirm the call being placed. Anyway, i need to allow user to dial emergency numbers. Thanks for this….. I’m new to programming as such and I am looking at using this code for switching on a multi sim… eg send 001 / 002 etc…. I’ll let you know if I get any where….. I tried your tutorial and I get a lot of it but it does not work on my side. I tried different numbers but cannot make it to work. Thanks for the code snippet! I’ve actually started a blog devoted to code snippets like these and thought I’d reach out and maybe you could check it out? It’s a pretty young blog (~ 3 weeks old now) but it’s doing pretty well… getting about 200-300 hits a day. And yea I’ve wanted to reach out to other blogs/sites like mine to help connect my site with others and ultimately help developers reach my site for potentially useful tutorials or examples. But yes let me know what you think! Hope to hear back! i try to workout the code,but it’s not working after clicking the dial button.i am new in the android platform.can you please suggest a text for refer ‘android’ .can u please give suggestion through mail. Thanks. To all those having issues with this demo app… take a look at this video from Google .. they explain how to do this in a few lines of code. how we build the gprs app in mobile android OS please reply me as fast as possible. how to build the gprs app in mobile android OS please reply me as fast as possible. For those of you, who have trouble geting it to actually dial. you can also click the Permissions tab, click the button Add, then in the namelist choose, android.permission.CALL_PHONE and the code will get added in the manifest. this shuld make your appication call the number enterd. If you want to be able to dial MMI/USSD codes from this script, you will need to make the following changes. 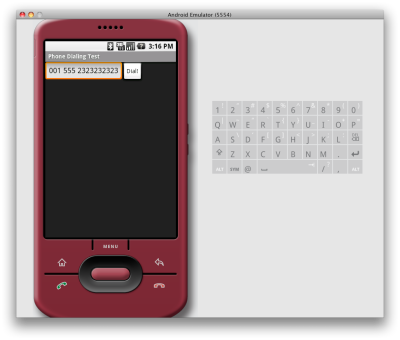 and alter the dialing line to Uri encode “#” and “*” characters. I hope that helps anyone trying to send MMI/USSD codes. 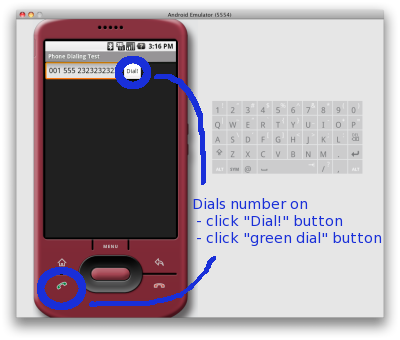 What a great blog on Android Development Demo: “DialANumber” – How to write your own very first Android program – Made Simple! « Android Development ! Am using Froyo – 2.2.1 – I tried the approach for call forwarding – by encoding the “#” (encoding “*” does not make any difference). But I am still not able to invoke automatic call forwarding using this approach. ACTION_DIAL works fine. The manifest has all the above permissions. Any insight will be useful…. how we use paint appl in mobile?